For many bloggers, Google AdSense is the main source of income. But still I have heard a lot that even they are getting 1K+ visitors daily, they hardly manage to earn only a few dollars (in the range of $5-10) per month. This is not fair..right? There are few basic things which I want to mention here before going into details like first select a beautiful design and make sure you are not doing any mistakes at the initial level. At this stage, I am considering that you are having an approved AdSense account and you are using their ads on your blog. If you don't have a fully AdSense approved account check tips to get AdSense approval. 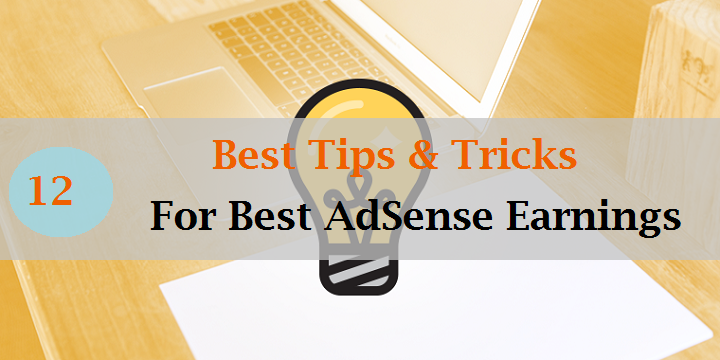 So below are few killer tips to get the best from AdSense account and I am sure after implementation you are going to earn best from it. The very first requirement to earn from any ad is to have a good looking design of your blog and it should support the ads too. If you are having a design in which you can place the ad in the footer of the page, then how can you be sure that your user will go to the footer and will click on your ads? So select only those design which fulfills your blogging requirement and most importantly it should be responsive and should have space to place the ad units. You can read our article to select the best template for your blog here. The selections of keywords are very important for the success of any online venture. In my previous article, I discussed the importance of keywords. So before serving any ads on your site first check the density of keywords. 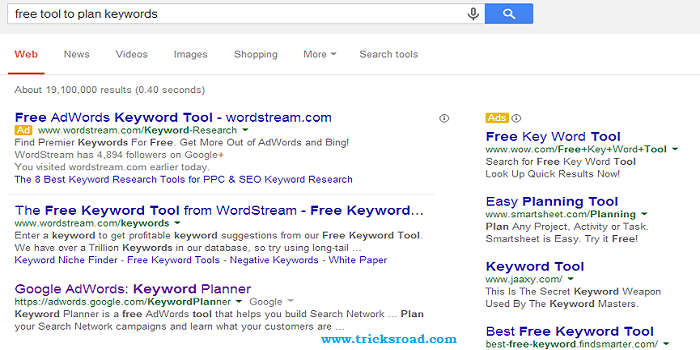 You can find many keyword planner tools on the internet free of cost. Use any one of them and spend some time before selection. Just search in Google and you will find hundreds of such sites. But I will recommend you to use the Google AdWords to select the keywords at least initially, later you can move to any other. Take care of the tag: Content is King! Your content needs to be likable, readable and shareable, to get maximum traffic. From a survey, it has been found that more than a million blog post is getting posted on the net daily, so you should need to be unique to have readers. And most importantly you should write the content for your readers not for the search engines or any other stuff. Because once you will be able to build a relationship with your readers, another thing like popularity and money will come automatically. Also, you should take care about the grammar, quality, and value of the content you write. You can also take help of tools to check grammar errors. The frequency of posts on your blog should be good. You should write a blog daily or at least one in two days. This will help the search engine to keep active your blog and readers will get more engaged. The number of content you will have, the number of visitors you will get. From my personal experience, I am telling you, if any visitor searches for a particular topic and reaches out to your blog, after reading that, if you are having other effective posts also; at least they will visit them. So try to be regular while posting and keep the older blog active. Then put AdSense unit to each and every page to earn better. There are plenty of ways to get banned or penalized by Google. The most common are spamming. People try to spam the Google (highest market share in searching). Sometimes for few hours/days, they get success but the Google script is so will form that they will find you and can ban. Do you want it? Of course not. You are well smart. So don’t try to copy the content from any other site. Write your own view. Research well before writing and definitely you are going to get success. Some days ago, I read a story on Facebook. A guy simply copied pasted some good post from top sites and made his own. Also, he used his AdSense and placed some ads and did some SEO and in 2 days made around $90. On the very third day, Google detected this and banned that person. So never let such case to happen. Another successful format is the 728x15 horizontal ad links, which can be placed on your navigation bar. So depending upon the space and requirement, select those which suits your blog. Also while creating the AdSense unit, consider the colors (background and fonts) of ads too. They should not look odd. Google Ads with no background color and no borders will always perform better. It’s a good practice to keep the background of ad similar to your page background. If you have good content on a page, increase the number of ad units, but don’t flood it. At most, you can use three units on a page, two AdSense search boxes and one unit of ad links. To earn more, always use at least one AdSense search box. Also, your content should be written in reader perspective, not the AdSense prospective. I am repeating this line because; when bloggers start getting dollars they mainly focus on ads, not the content. But you should remember, due to content itself, you have received ads. To complete this list, I’ll write a separate post on highest paying keywords :) But again remember, display only relevant ads on your blog. You must follow the AdSense terms & conditions and policy. You can read their T&C here. These terms vary depending on the location. This guide will help you to understand their terms and policies and you will avoid doing mistakes. You should never modify the generated HTML codes. If you are having a problem while placing the ads in your post, just drop your question below and we’ll find the solution and will help you. Never ever edit the code. Also never place ads in pop-up windows, error pages, and empty pages. Else Google will instantly ban your account. Don’t click on your own ads and don’t even ask anyone to click. Conclusion: Making good money from AdSense is not too hard but at the same time it’s not too easy also. A lot of hard work and patience needed. But after following the above tips I am sure you are going to make good from it. Friends what’s your thought on this. Kindly do share your opinion through a comment. If this article has helped you, please share it on your social sites. 18 comments to ''12 Tips and Secrets to Get Best AdSense Earning from Blog"
Your page on Google+ keeps sharing wonderful posts throughout the day. Seems to be like you are soon getting AdSense for your blog. You have provided a nice description about the tips for earning more from AdSence; sounds useful. Bookmarked the post will read it again whenever in future I apply for the same. Thank you for sharing this. Have a nice day! And very much thanks for the compliment. I've seen many bloggers earning thousands of dollars from AdSense and they too share the similar thoughts to increase the earning. Thanks for the comment, Keep visiting !! Thanks Satya for stopping by and I am glad that you liked it. Have a great weekend !! Adsense guide is very helpful. I learn few points from your article. Thanks Satish for stopping by !! And i am glad to know that you found it helpful. Though this post was made for those who had Adsense account already. But i think it's also useful to me . .
After i applied my first Adsense in the year 2013 which They disapproved , and since then I've never applied again. after going through to this your Article, i think is time i give it a try once more maybe my time will shine for good. Okay I'll do just that . . I go with your words man. Arkads- Please check for the ad placement. Also you can ban few ad that pay less. By this way you can get good earning. A very fine article on adsense. So informative and the tips you have mentioned are easy to implement. I am surprised that I missed this article. Thanks for sharing.. Thanks Ikechi for your wonderful comment. I am glad that you liked the blog and good luck for the AdSense approval. Hope you'll get that soon. Keep visiting.